3 locations open 7 days a week. Sun - Mon - Tue - Wed: 6 a.m. to 10 p.m.
Thur - Fri - Sat: 6 a.m. to 2 a.m.
We are located on the edge of Henderson just off of Russell Rd and the 95, in the same plaza as AM/PM and Teriyaki Madness. We have something for everyone, even meals for your little ones. We also offer a variety of delectable catering packages suitable for almost any sized event. 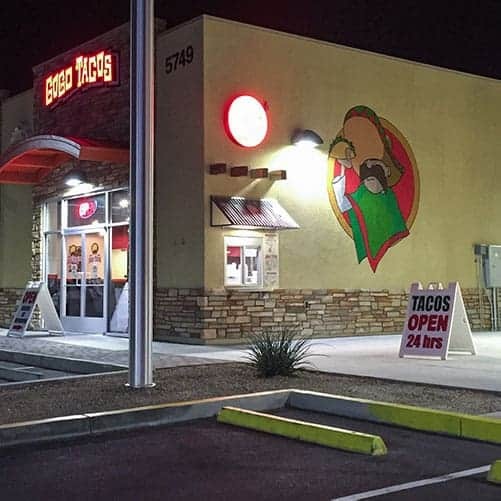 Our walk up window is available for GoGo Tacos access as well! Call us, or stop by today! We look forward to feeding you!